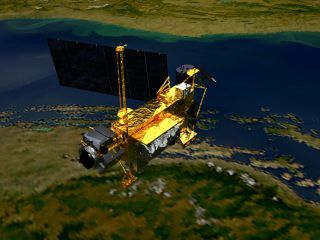 An artist's concept of the Upper Atmosphere Research Satellite (UARS) satellite in space. The 6 1/2-ton satellite was deployed from space shuttle Discovery in 1991 and decommissioned in December 2005. For the latest news about NASA's UARS spacecraft fall, visit: Falling NASA Satellite: Complete Coverage of UARS Spacecraft's Fiery Demise. A decommissioned NASA satellite is expected to plummet to Earth today (Sept. 23), and agency officials are monitoring the dead spacecraft closely to try to narrow down when and where the debris will fall. According to NASA, the Upper Atmosphere Research Satellite, or UARS, will make its fiery descent through the atmosphere some time this afternoon or early evening (Eastern Daylight Time), but while it is still too soon to tell where pieces of the defunct satellite will land, scientists have been able to rule out North America from the potential impact zone. The bus-size, 6.5-ton UARS spacecraft is one of the largest NASA satellites to plunge back to Earth uncontrolled in more than 30 years. "The most massive NASA satellite to re-enter uncontrolled since Skylab was the Pegasus 2 satellite in November 1979," Nick Johnson, chief scientist of NASA's Orbital Debris Program Office at the Johnson Space Center in Houston, told SPACE.com in an e-mail last week. "It had a mass of 10.5 metric tons, almost twice that of UARS." Despite the fact that UARS will fall to Earth uncontrolled, NASA officials have stated that the chance of debris landing in populated regions of the planet is extremely remote. "There's always a concern," said Mark Matney, a scientist at the Orbital Debris Program Office. "But, populated areas are a small fraction of the Earth's surface. Much of the Earth's surface has either no people or very few people. We believe that the risk is very modest." The $750 million climate satellite measures 35 feet (10.7 meters) long and 15 feet (4.5 m) wide. It was launched in 1991 aboard the space shuttle Discovery, and studied the ozone layer and chemical makeup of Earth's upper atmosphere before it was decommissioned in December 2005. Originally, NASA anticipated that the UARS satellite would fall to Earth sometime between late September and early October, but heightened solar activity last week increased the spacecraft's drag, pulling it down to Earth sooner than expected. You can track the UARS satellite fall using several skywatching tools, including the Satellite AR Android app created by the company Analytical Graphics Inc.